Check out these words from Robert Kelly. Hi guys, my name’s Robert Kelly and I WAS running for the Vice President of the well known Pulse party. However, as many of you already know, we were disqualified from running under the name ‘Pulse’ as another party had already registered under this name. What you don’t know is that the President running for this fake Pulse party is Zac ‘Dexter’ Draheim – who is Colin Finke’s best friend from Cromwell College. Ben ‘Husky’ Durance is running as Secretary of the party, and is also a close friend of Colin’s, and the rest of the executive positions in this fake party are Cromwell College residents. No doubt Fresh will remove these boys from these positions after this post goes out and replace them with new ones, but please do not be fooled as they will only be replaced by other secret Fresh supporters. Party nominations have now closed, so when you see ‘Pulse’ on the ballot sheet, just know that it is a fake Pulse and if you tick that box, or any other box that appears on the ballot sheet, you are in reality, supporting Fresh. Here is an image of the notice on the UQU Notice boards for evidence. 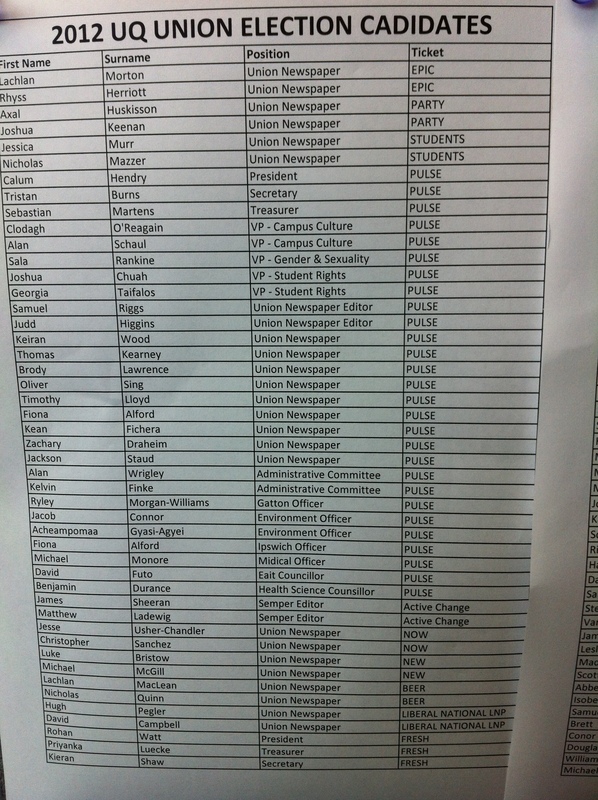 Zach Daheim is actually listed under ‘Union Newspaper’ for PULSE, not President. P.S. How confident are you in the competance of our Returning Officer that she misspells ‘candidate’ on this public document? Here’s another document drawn from a good old Facebook stalk, if you can read it.